Thanks to reality tv cooking competitions, the sous vide cooking method, which dates back to the 70s, has gone mainstream. In the quest for gourmet meals from the convenience of their own kitchens, sous vide has been a trending technique for home cooks and is becoming more accessible than ever. French for "under vacuum," sous vide cooking is the process of sealing food in an airtight bag or container and then cooking that food in a temperature-controlled water bath. Vacuum sealers are often used alongside of sous vide cooking at home. The key is to cook the contents evenly, ensuring that the inside is properly cooked without overcooking the outside and retaining moisture. Steam ovens have also been released, allowing you to get sous vide style cooking without a water bath. When a Miele steam combi oven(an XL or XXL version for bigger families will do) and a warming drawer are installed together, you won't even notice the drawer below unless it is open. Sous vide cooking is carried out in a steam combination oven at a low, even temperature over a long period of time. The look, shape, minerals, and vitamins of the food remain the same. You may check out best steam oven article for more information on steam ovens. Let's take a look at how a Miele Warming Drawer delivers the beginnings of sous vide style food preparation, as well as some features that make it a delight to use. The Miele warming drawer is 24" wide by 14" high, with a fully telescopic extension for easy operation and a 120V electric rating. It's perfect for marinating, vacuum sealing, portioning, or storing in preparation for sous vide cooking. It also offers multiple modes of sealing for different food types-- three modes for meat, two for liquid foods and one for delicate fruits. The Miele steam combi oven takes sous vide style cooking a step further. It features M-Touch Controls that are easy to operate with intuitive swipe gestures to quickly navigate to your desired selection. It also features a PerfectClean Enamel Interior for anti-stick cleaning with just a bit of soapy water and a sponge. Remote vision capability is also available, giving you WiFi connectivity to Miele's service center so that your oven can be remotely maintained for even better long-term performance. Monogram and GE Cafe have sous-vide probes that work specifically with induction Cooktops. A probe can help you achieve restaurant-quality results by attaching to your existing cookware and wirelessly controlling the temperature of your food. It can maintain the temperature within 1° via a cooktop control, with a full temperature range of 85-200° degrees Fahrenheit. This is ideal for sous vide or slow cooking style tasks, as well as carefully melting chocolate and other tasks. You'll also enjoy Bluetooth compatibility, a rechargeable battery kit with a USB hookup that you'll only need to charge after 40 hours of use, and compatibility with GE Cafe Series and Monogram 30" and 36" Induction cooktops. Because induction cooktops are capable of reaching and maintaining low temperatures, the sous vide probe is a helpful gadget for those who are looking to integrate this technique in their daily cooking routine. This accessory plugs into a jack under the cooktop burner box and is magnetic, so it sticks to the underside of the cooktop. The module (adapter) communicates with the probe using Bluetooth. GE's Sous Vide probe can be purchased in their GE Appliance Parts online store. 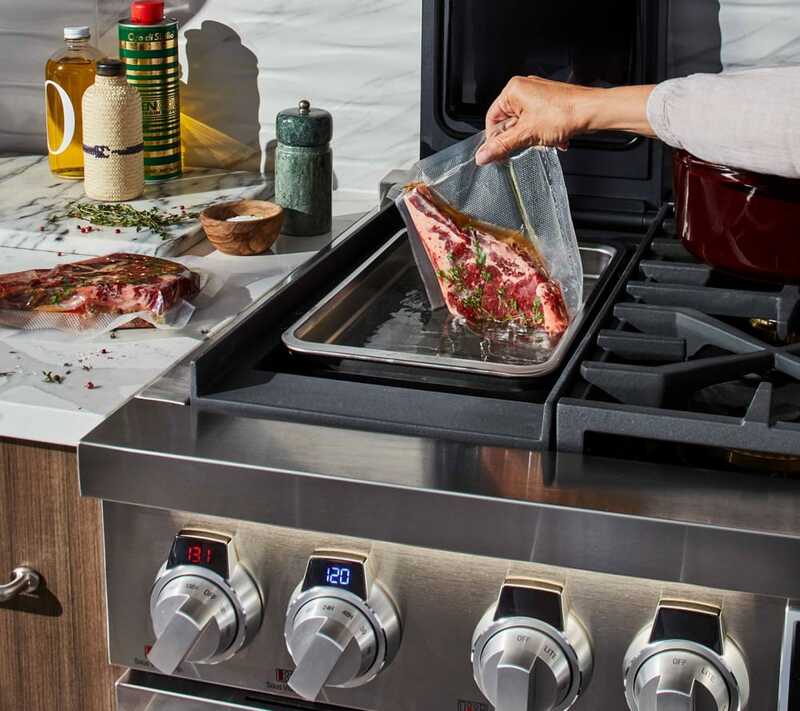 LG recently unveiled their signature kitchen, with a range that offers the industry's first built-in sous vide for delivering the ultimate precision cooking capabilities. They've managed to engineer a hermetically and magnetically sealed lid that delivers precise temperature within 1° of your setpoint. Finally, LG even offers an app that allows you to start the process, control the temperature, and follow the cooking progress as you go. Sous vide has been making waves as a convenient, delicious cooking style that's transforming the way people prepare and eat food. It's a game-changer to use sous vide at home for precision cooking. When it comes to streamlining precision temperature cooking, we think our highlighted options far outweigh the other sous vide gadgets that, in some cases, involve more steps and require more kitchen space for water baths and standalone machines. If you'd like to experience an approach to cooking once reserved for the highest-end restaurants in the world, try a sous vide cooking product on for size. Food-safe zipper bags such as Ziploc and Food Saver vacuum bags work great for sous vide. Unlike cooking on a stove or grill, a sous vide steak will take an hour or more, which is primarily hands-off cooking. Can you overcook when sous vide cooking? Because the water bath is set to the same temperature you want the food to reach, you can't overcook with sous vide. With sous vide cooking, precise times are not a big concern. Little or no added salt or fat is needed when sous vide cooking. Vacuum sealing food means that vitamins and minerals are not lost during the cooking process unlike boiling or steaming.